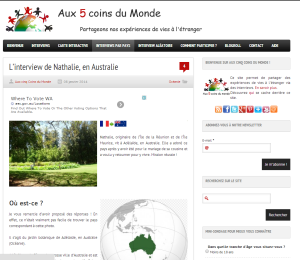 I’ve been interviewed by a French website, ‘Aux cinq coins du monde’ (www.aux-cinq-coins-du-monde.com). The exercice was quite interesting and funny, especially for the journalist I am. It reminded me about the one I’ve done for a Reunionnese website, ‘Réunionnais du Monde’ (Reunionnese around the World). But the most impressive was with 3Z Radio (Mauritian community radio) in Melbourne in 2011. Being journalist and being interviewed are two very distinct experiences. I realised how inconvenient and stressful it could be to seat on this position. And I even sang this day, live on the radio. But it was so much fun.